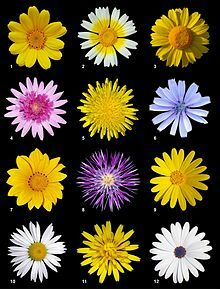 A damned or damn yellow composite (DYC) is any of the numerous species of composite flowers (family Asteraceae) that have yellow flowers and can be difficult to tell apart in the field. It is a jocular term, and sometimes reserved for those yellow composites of no particular interest. Notable individuals who referred to these difficult yellow composites as "DYCs" include Oliver Sacks and Lady Bird Johnson. Look up DYC in Wiktionary, the free dictionary. This Asteraceae-related article is a stub. You can help Wikipedia by expanding it. This page was last edited on 23 January 2019, at 18:03 (UTC).